Here is an enlightening new volume that presents an integration of anti-fat-oppressive attitudes into the work of feminist therapy. Overcoming Fear of Fat is unique among professional work in the area of women and fat in that it does not approach size as the problem; rather it approaches prejudice against fat as the problem. 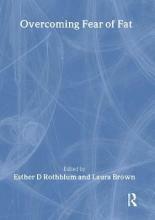 Although for nearly a decade, fat activists have been raising the issues that are confronted in this book, therapists, including feminist therapists, have been colluding with their clients in pathologizing fat, celebrating weight loss, and failing to adequately challenge cultural stereotypes of attractiveness for women, instead of empowering clients and encouraging them to take on expert authority about their own experiences. The contributors, including therapists and fat activists, aim to disconnect the issues of food intake and eating disorders from those of weight. They share personal and professional experiences of challenging fat oppression, offer strategies for therapists to rid themselves and their clients of fat oppressive attitudes, and most importantly, they confront long-held cultural myths that fat is unhealthy, and that fat women are physically unfit and are in hiding from their sexuality or personal power. A practical and informative resource for therapists, especially those who work with fat women or who themselves struggle with issues of feeling critical of their own body size, Overcoming Fear of Fat will also be a valuable guide for fat women who wish to feel supported in their struggle for self-worth and respect.